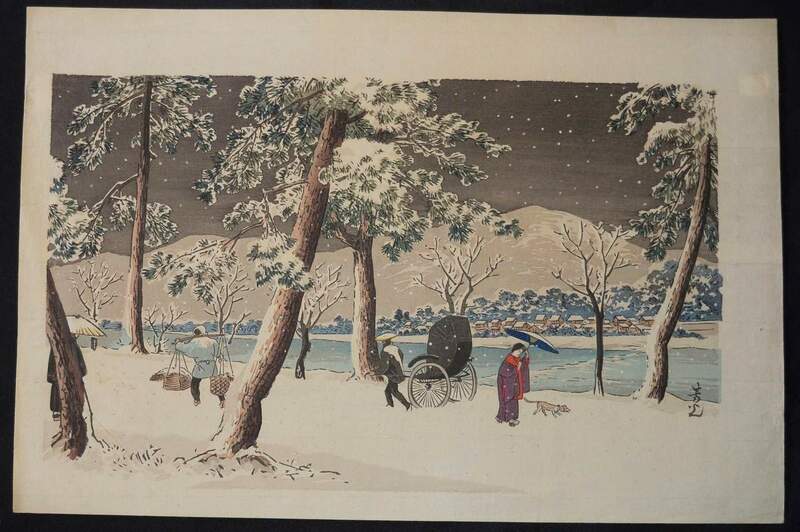 THIS PAGE OFFERS A SELECTION OF RARE FIRST EDITION ORIGINAL SHIN AND SOSAKU HANGA WOODBLOCK PRINTS. 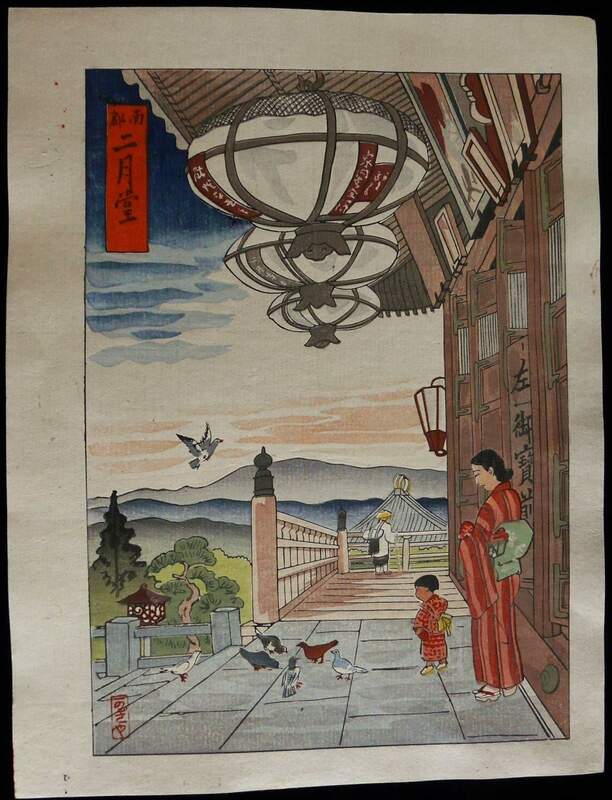 A number of artists are represented, and the first edition woodblock prints displayed are among the rarest early twentieth century scenes to be found. We have also included a selection of late edition scenes. ARTISTS ARE LISTED IN ALPHABETICAL ORDER. OHNO BAKUFU was born in Tokyo in 1888 and Lived until 1976. 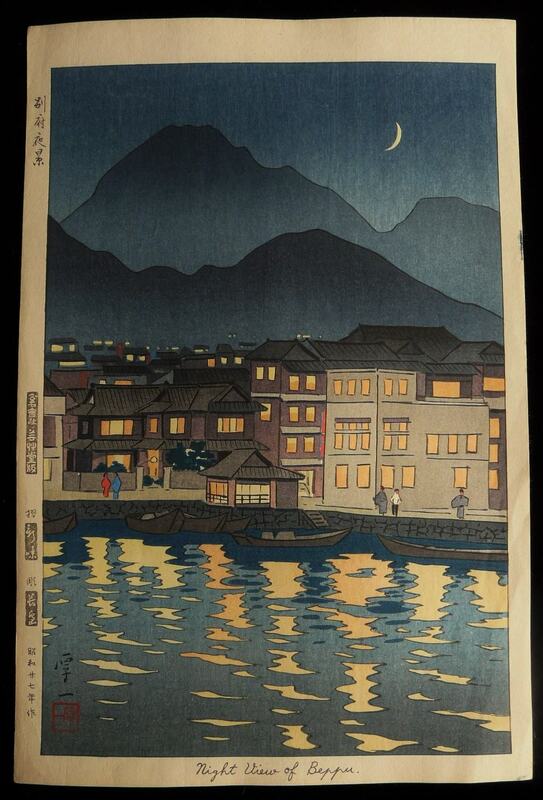 He made great inroads into the Shin Hanga style and much of his work was published by Kyoto Hanga In. 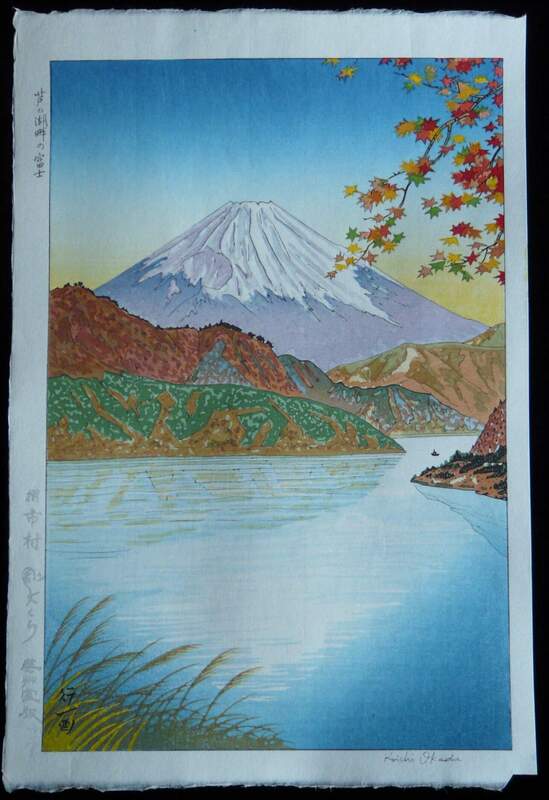 His work is among the Rarest of Shin Hanga Artists and examples from the 1950s are difficult to find and offer an excellent investment opportunity. 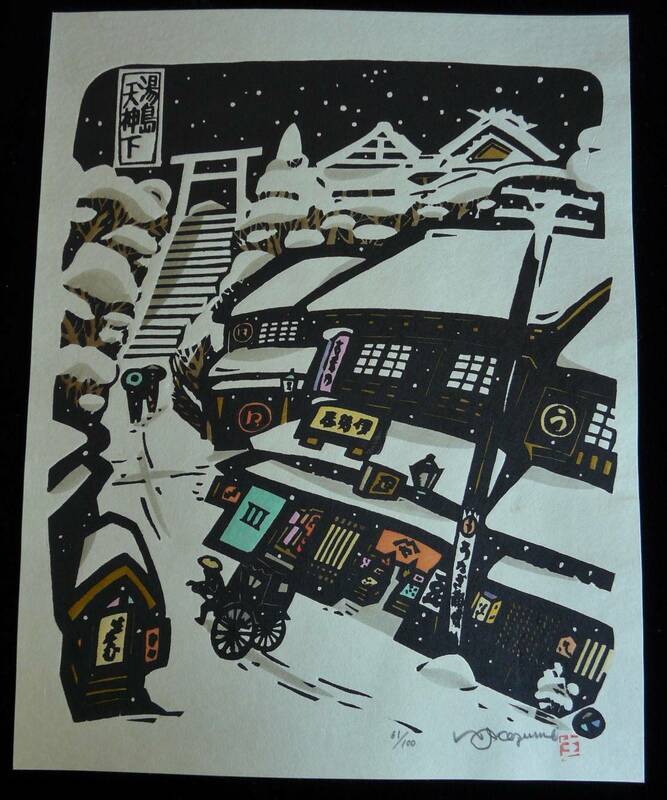 SPECIAL ATTRIBUTES: Published by Kyoto Hanga-in. CONDITION: Very Good, Never been framed. See photo. AUTHENTICATION: Artist’s Seal in Lower Left of Scene. Publishers’ Seal with Copyright Claim and Date in Right Margin. KYOZO ENDO was born in Tokyo in 1897 and Lived until 1970. He graduated from the Tokyo School of Fine Arts in 1921 and he was one of those Great Artists of the time who worked for the Love of the Artform more than Anything Else. His Work Never Gained any Great Recognition until after his death except for Being Displayed in the Official Exhibitions of Teiten and Bunten. During his Life he Obtained a Teaching Post at the Women’s College of Fine Arts but Considering the Advanced Creativity of His Work and His Unwillingness to Compromise his Original Talents he was Very Undervalued at the Time. Few of his Works Have Survived and it is Very Rare in Today’s Market. SPECIAL ATTRIBUTES: A Very RARE and Amazing, Fine Silver Mica Highlights in Reflection of the Alps in the Surface of the Lake. CONDITION: Excellent, Never been framed. See photo. AUTHENTICATION: Artist’s Seal in Lower Right of Scene. Title, Okura Carver and Yamagishi Kazue Seals, and Artist’s Characters Seal on Reverse Side. CONDITION: Very Good for Age, Never been framed. See photo. AUTHENTICATION: Red Tomiochi Seal in Lower Right of Scene. Red Adachi Publishers Seal in Bottom of Right Margin, Title and Date in Left Margin. NISHIJYAMA HIDEO was born in 1911 and graduated from the Kyoto Specialist School or Painting. 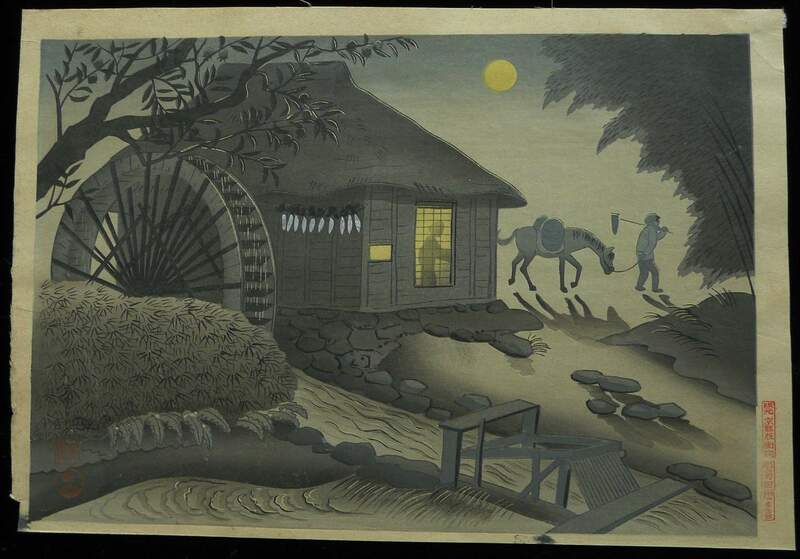 He began creating woodblock prints later in his life and most of his scenes date from the 1940s. His work displays a unique mix of traditional and modern and is very difficult to find. ALL EXAMPLES ARE ORIGINAL FIRST EDITIONS. CONDITION: Amazing, Excellent Condition for Age, Never been framed and Held in Safe Storage for Many Years. See photo. AUTHENTICATION: Unsodo Publishers Seal and Copyright Claim in Right Margin with Artist’s Signature in Lower Right of Scene..
AUTHENTICATION: Unsodo Publishers Seal and Copyright Claim in Right Margin with Artist’s Signature in Lower Right of Scene. 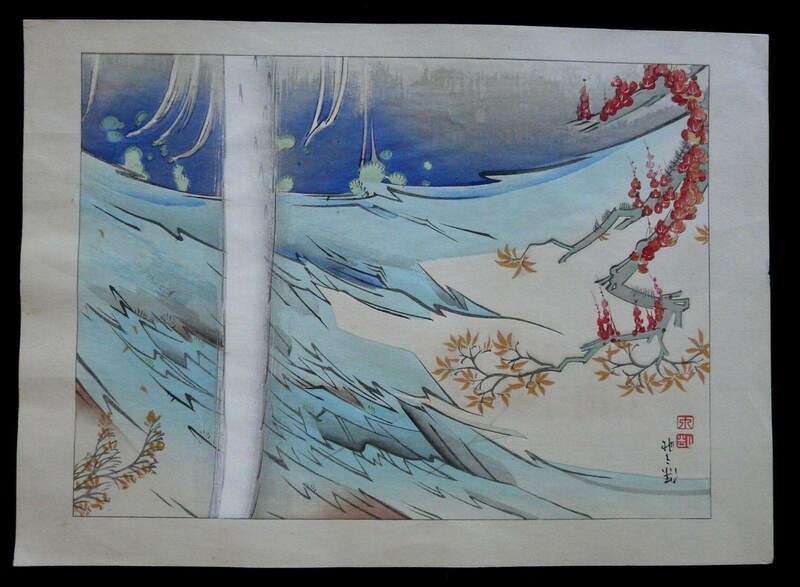 AUTHENTICATION: Unsodo Publishers Seal and Copyright Claim in Right Margin with Artist’s Signature in Lower Right of Scene.Red Tomiochi Seal in Lower Right of Scene. Artist’s Red Seal in Bottom Margin also. EXCELLENT CONDITION, NEVER BEEN FRAMED. KAGIYA worked in the 1930s and little is known about his life. His work focused on life in Japan in the 1930s. KENJI KAWAI lived from 1908 to 1995 and was Born in Kyoto. 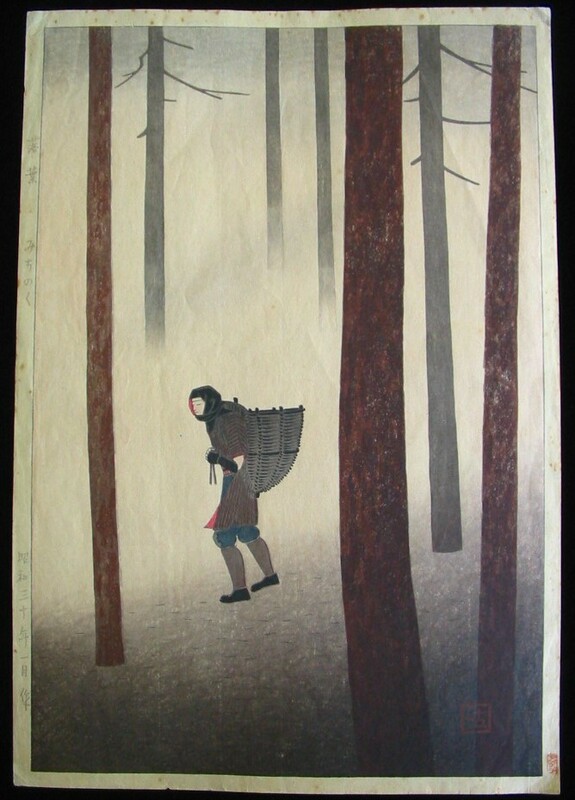 He Graduated from the Kyoto City Specialist School of Painting and Produced a Limited Number of Woodblocks all Displaying a Modernistic Style which was Unique for the Time and most published by Unsodo. KOICHI OKUMURA was born in Kyoto and studied painting under Nishimura Goun. His work was displayed in a number of exhibitions and he became an Art Professor at the Kyoto University of Art. 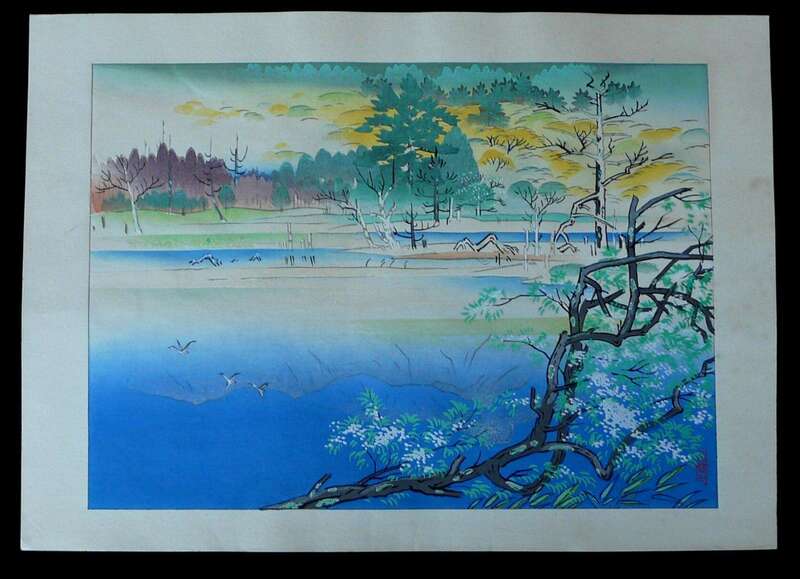 His first woodblock prints appeared in 1948 and and his first edition woodblock scenss are very rare. Title, Date Showa 27 which is 1952, Unsodo Publishers Seal, Shinmi Printers and Nagashima Carvers Seals Can be Seen in the Left Margin. The inclusion of the Date Authenticates this as an Original First Edition as Unsodo never dated any but the First Edition. KOITSU TSUCHIYA was born in rural Japan and became a student of Kiyochika Kobayashi who lived from 1847 to 1915. He worked and studied for 19 years in the home of Kobayashi. Artist’s Signature and Round Red Seal reading SHIN which means TRUE in bottom Right of Scene. Title and Date in Left Margin With Watanabe 7mm Seal in lower left of scene and Red Heisei Seal in Right Margin. 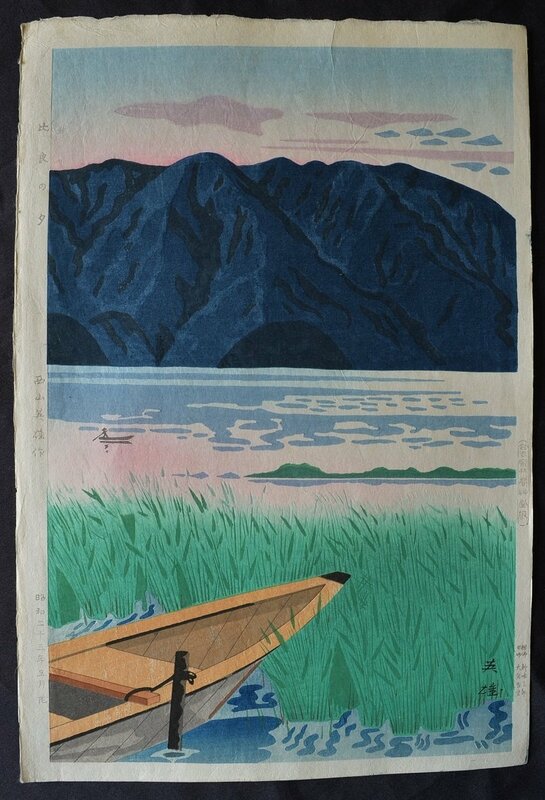 Originally Created in 1940 and this example is a Later Edition Hand Printed from the Original Hand Carved Woodblocks by the Watanabe Woodblock Print Company in Tokyo. EXCELLENT CONDITION NEVER BEEN FRAMED. OKADA KOICHI was born in Japan in 1907 and began painting in oils when he was about 20 years old. 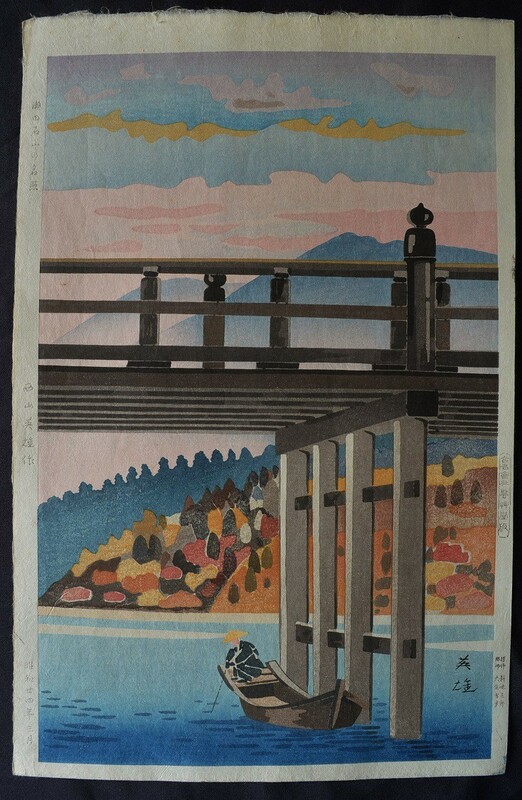 In the 1940’s he designed a series of seven woodblock scenes for the Unsodo Woodblock Print Company in Kyoto and some others for the Watanabe Woodblock Print Company in Tokyo as well as a few other scenes but his output was minimal and there are few examples of his fine woodblock art available. There may be marginal differences in print sizes. Artist’s Signature in bottom left of Scene & in English in the bottom margin. . Title and Unsodo Copyright Claim in left margin. SHUNGO SEKIGUCHI was born in Japan in 1911 and Lived until 2002.He Contributed to the Famous 1932 series of prints, “One Hundred Views of Great Tokyo” and In 1935, after being awarded a scholarship from the French Government, he moved to Paris and Began Studying at L’Ecole des Beaux Art. He has Received a Number of Awards in France and in Japan and Examples of his Excellent Woodblocks of Paris Scenes can be Found in the Museum of Modern Art in Tokyo. A RARE PRINT IN PRISTINE CONDITION AND VERY DIFFICULT TO FIND. TAKAGI TOMONUSUKE was born in Hirosaki in Aomori Prefecture and attended Musashino College of Fine Arts in Tokyo. 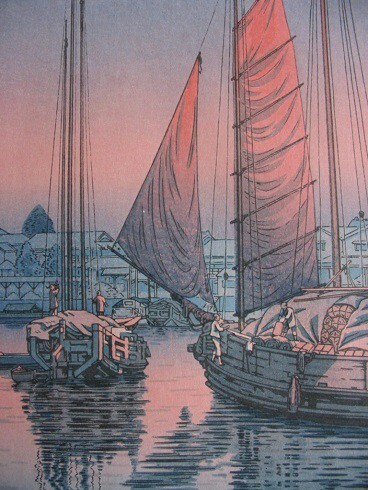 He studied moku hanga with Amano Kunihiro but is largely self-taught. 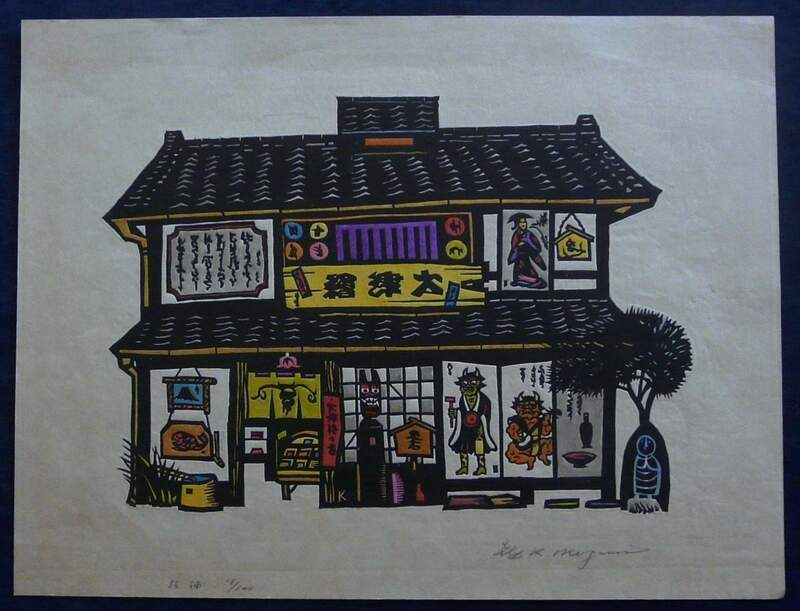 Takagi exhibited with the Nihon Hanga Kyokai and the Kokugakai artist societies and was a member of the Nihon Hanga Kyokai from 1961. 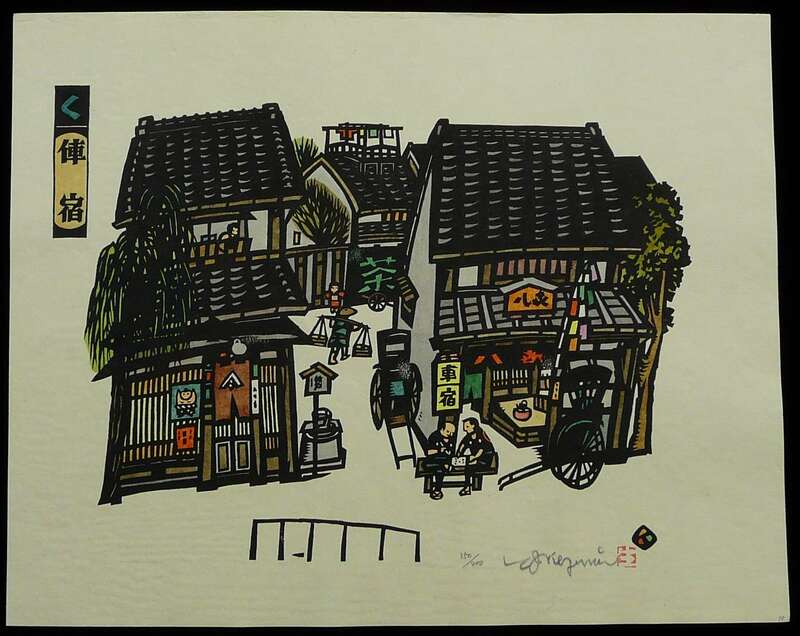 His work was in many international competitions and he won awards from the Japan Print Association in 1960 and the Sao Paulo Biennnale in 1967. 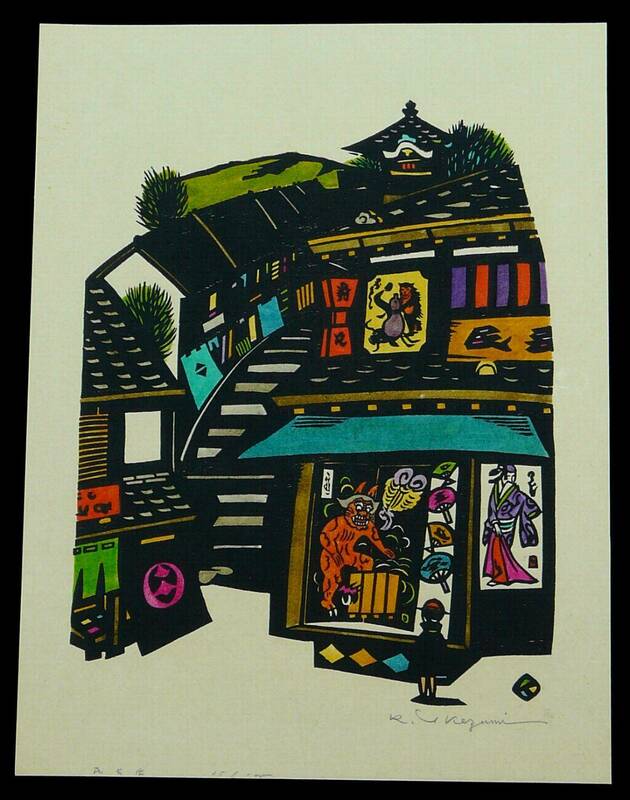 AUTHENTICATION: Artist’s Characters, Title, Okura carver’s Seal and Nishimura Printer’s Characters on Reverse Side. Includes Same Size Original Information Sheet with Blind Printed Backgound. NOMURA YOSHIMITSU was born in 1870 and lived until 1958. 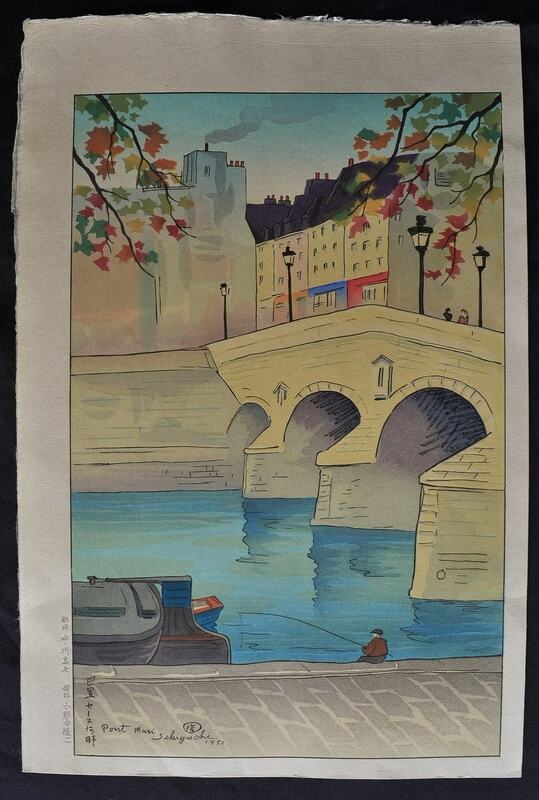 He belonged to the Kyoto Artist’s Ground who all worked for the Publisher Sato Shotara. Little is know about his life or background but he had a good reputation and his work was so highly regarded that he was invited to attend and display his art at the famous “Toledo Exhibition” in Ohio in 1936 which helped to bring some international focus to his work. 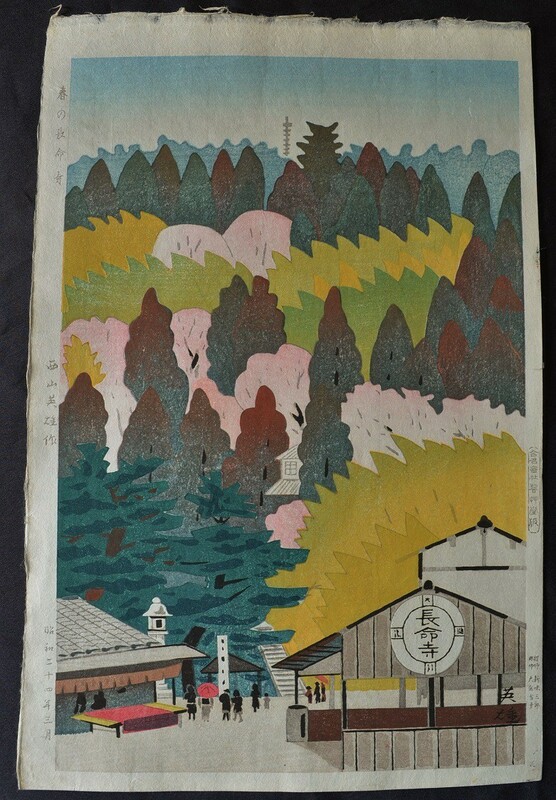 I am hoping to find more of his fabulous woodblock prints on my next trip to Japan at the end of November. AUTHENTICATION: Artist’s Signature and Seal in Lower Right of Scene with Publisher’s Seal in Right Margin. 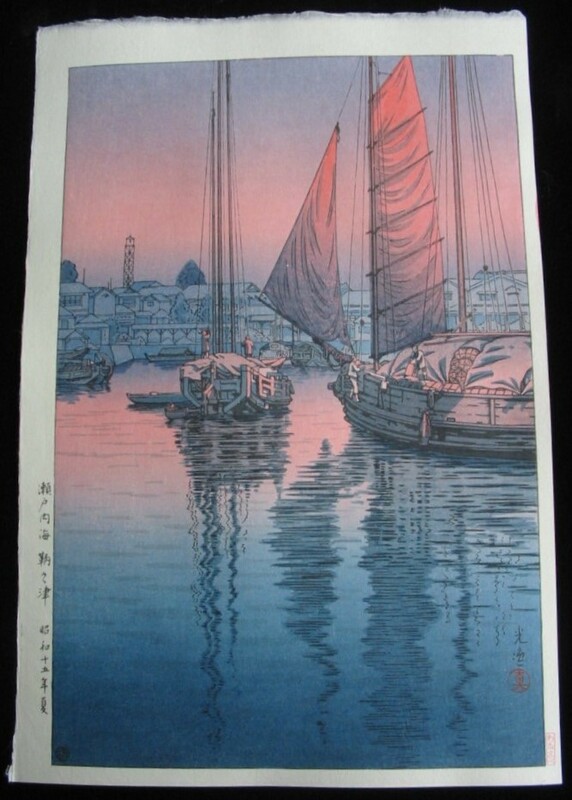 We also stock Japanese woodblock prints by the following Shin Hanga artists. Just click on the name to go direct to their individual page.